I know I have made a lot of takes on the mighty turkey reuben (see also: Reuben Stuffed Turkey Burgers), but this recipe is the truest in flavor to the sandwich original. If someone placed this macaroni in front of you at a diner, you wouldn’t bat an eye. You might notice that the ratio of ingredients seems a little different from most mac & cheese recipes – that’s because the sauce is less of a sauce and more of a big, gooey pile of melted cheese. Oh yeah. P.S. If you’re a beef eater you couldn’t go wrong subbing out the turkey for some corned beef. Cook pasta according to package directions, then drain and set aside. While pasta is boiling, prep the rest of your ingredients. Toast the caraway seeds, 1 – 2 minutes in a dry skillet over medium heat. Dice the turkey into 1/2 inch squares; it’s easiest to stack the slices and cut them all at once. Squeeze as much liquid as you can out of the sauerkraut. Melt the butter in a large saucepan over medium heat, swirling to coat the bottom of the pan. Whisk flour into melted butter, then cook an additional 2 -3 minutes to get rid of the “raw” taste. You are looking for the roux to take on a slightly brown color and start to smell amazing. Working in 4 batches, whisk the milk into the roux, whisking out all of the lumps. Raise the heat slightly and bring the sauce to a simmer. Stir the swiss and gruyere into the sauce. When the cheese has melted remove the pan from the heat. 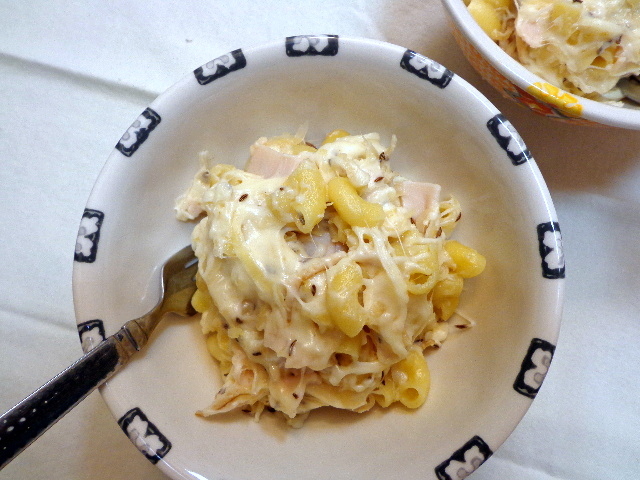 Fold cooked macaroni, sauerkraut, toasted caraway seeds, and diced turkey into the cheese.